The Palestinians left their homes in 1947-48 for a variety of reasons. Thousands of wealthy Arabs left in anticipation of a war, thousands more responded to Arab leaders' calls to get out of the way of the advancing armies, a handful were expelled, but most simply fled to avoid being caught in the cross fire of a battle. Had the Arabs accepted the 1947 UN resolution, not a single Palestinian would have become a refugee and an independent Arab state would now exist beside Israel. The beginning of the Arab exodus can be traced to the weeks immediately following the announcement of the UN partition resolution. The first to leave were roughly 30,000 wealthy Arabs who anticipated the upcoming war and fled to neighboring Arab countries to await its end. Less affluent Arabs from the mixed cities of Palestine moved to all-Arab towns to stay with relatives or friends. By the end of January1948, the exodus was so alarming the Palestine Arab Higher Committee asked neighboring Arab countries to refuse visas to these refugees and to seal the borders against them. Throughout the period that preceded the May 15 invasion of the Arab regular armies, large-scale military engagements, incessant sniping, robberies and bombings took place. In view of the thousands of casualties that resulted from the pre-invasion violence, it is not surprising that many Arabs would have fled out of fear for their lives. The second phase of the Arab flight began after the Jewish forces started to register military victories against Arab irregulars. Among the victories were the battles for Tiberias and Haifa, which were accompanied by the evacuation of the Arab inhabitants. The [Palestine] Arabs have suffered a series of overwhelming defeats….Jewish victories … have reduced Arab morale to zero and, following the cowardly example of their inept leaders, they are fleeing from the mixed areas in their thousands. It is now obvious that the only hope of regaining their position lies in the regular armies of the Arab states (Barry Rubin, “How the Palestinians Trap Themselves and Drag the West Along,” PJ Media, (May 5, 2013). John Bagot Glubb, the commander of Jordan's Arab Legion, said: “Villages were frequently abandoned even before they were threatened by the progress of war” (London Daily Mail, August 12, 1948). In early April, an estimated 25,000 Arabs left the Haifa area following an offensive by the irregular forces led by Fawzi al­Qawukji, and rumors that Arab air forces would soon bomb the Jewish areas around Mt. Carmel. On April 23, the Haganah captured Haifa. A British police report from Haifa, dated April 26, explained that “every effort is being made by the Jews to persuade the Arab populace to stay and carry on with their normal lives, to get their shops and businesses open and to be assured that their lives and interests will be safe.” In fact, David Ben-Gurion had sent Golda Meir to Haifa to try to persuade the Arabs to stay, but she was unable to convince them because of their fear of being judged traitors to the Arab cause. By the end of the battle, more than 50,000 Palestinians had left. Tens of thousands of Arab men, women and children fled toward the eastern outskirts of the city in cars, trucks, carts, and afoot in a desperate attempt to reach Arab territory until the Jews captured Rushmiya Bridge toward Samaria and Northern Palestine and cut them off. Thousands rushed every available craft, even rowboats, along the waterfront, to escape by sea toward Acre (New York Times, April 23, 1948). In Tiberias and Haifa, the Haganah issued orders that none of the Arabs' possessions should be touched, and warned that anyone who violated the orders would be severely punished. Despite these efforts, all but about 5,000 or 6,000 Arabs evacuated Haifa, many leaving with the assistance of British military transports. As fear and chaos spread throughout Palestine, the early trickle of refugees became a flood, numbering more than 200,000 by the time the provisional government declared the independence of the State of Israel. The Arabs of Palestine left their homes, were scattered, and lost everything. But there remained one solid hope: The Arab armies were on the eve of their entry into Palestine to save the country and return things to their normal course, punish the aggressor, and throw oppressive Zionism with its dreams and dangers into the sea. On May 14, 1948, crowds of Arabs stood by the roads leading to the frontiers of Palestine, enthusiastically welcoming the advancing armies. Days and weeks passed, sufficient to accomplish the sacred mission, but the Arab armies did not save the country. They did nothing but let slip from their hands Acre, Sarafand, Lydda, Ramleh, Nazareth, most of the south and the rest of the north. Then hope fled (Middle East Journal, October 1949). As the fighting spread into areas that had previously remained quiet, the Arabs began to see the possibility of defeat. As the possibility turned into reality, the flight of the Arabs increased-more than 300,000 departed after May 15 — leaving approximately 160,000 Arabs in the State of Israel. The Arabs' fear was naturally exacerbated by the atrocity stories following the attack on Deir Yassin. The native population lacked leaders who could calm them; their spokesmen, such as the Arab Higher Committee, were operating from the safety of neighboring states and did more to arouse their fears than to pacify them. Local military leaders were of little or no comfort. In one instance the commander of Arab troops in Safed went to Damascus. The following day, his troops withdrew from the town. When the residents realized they were defenseless, they fled in panic. “As Palestinian military power was swiftly and dramatically crushed and the Haganah demonstrated almost unchallenged superiority in successive battles,” Benny Morris noted, “Arab morale cracked, giving way to general, blind, panic or a ‘psychosis of flight,’ as one IDF intelligence report put it” (The Birth of the Palestinian Refugee Problem Revisited, MA: Cambridge University Press, 2004, p. 591). Observers feel that with proper counsel after the Israeli­Egyptian armistice, the Arab population might have advantageously remained. They state that the Israeli Government had given guarantees of security of person and property. However, no effort was made by Egypt, Transjordan or even the United Nations Palestine Conciliation Commission to advise the Faluja Arabs one way or the other (New York Times, March 4, 1949). Benny Morris, the historian who documented instances where Palestinians were expelled, also found that Arab leaders encouraged their brethren to leave. Starting in December 1947, he said, “Arab officers ordered the complete evacuation of specific villages in certain areas, lest their inhabitants ‘treacherously’ acquiesce in Israeli rule or hamper Arab military deployments.” He concluded, “There can be no exaggerating the importance of these arly Arab-initiated evacuations in the demoralization, and eventual exodus, of the remaining rural and urban populations” (The Birth of the Palestinian Refugee Problem Revisited, MA: Cambridge University Press, 2004, p. 590). The Arab National Committee in Jerusalem, following the March 8, 1948, instructions of the Arab Higher Committee, ordered women, children and the elderly in various parts of Jerusalem to leave their homes: “Any opposition to this order...is an obstacle to the holy war...and will hamper the operations of the fighters in these districts” (Morris, Middle Eastern Studies, January 1986). Morris also documented that the Arab Higher Committee ordered the evacuation of “several dozenvillages, as well as the removal of dependents from dozens more” in April-July 1948. “The invading Arab armies also occasionally ordered whole villages to depart, so as not to be in their way” (The Birth of the Palestinian Refugee Problem Revisited, MA: Cambridge University Press, 2004, p. 592). Since 1948 we have been demanding the return of the refugees to their homes. But we ourselves are the ones who encouraged them to leave. Only a few months separated our call to them to leave and our appeal to the United Nations to resolve on their return. “The Arab States encouraged the Palestine Arabs to leave their homes temporarily in order to be out of the way of the Arab invasion armies,” according to the Jordanian newspaper Filastin (February 19, 1949). The tragedy of the Palestinians was that most of their leaders had paralyzed them with false and unsubstantiated promises that they were not alone; that 80 million Arabs and 400 million Muslims would instantly and miraculously come to their rescue. The Haganah did employ psychological warfare to encourage the Arabs to abandon a few villages. Yigal Allon, the commander of the Palmach (the “shock force of the Haganah”), said he had Jews talk to the Arabs in neighboring villages and tell them a large Jewish force was in Galilee with the intention of burning all the Arab villages in the Lake Huleh region. The Arabs were told to leave while they still had time and, according to Allon, they did exactly that. As was clear from the descriptions of what took place in the cities with the largest Arab populations, these cases were clearly the exceptions, accounting for only a small fraction of the Palestinian refugees. The expulsions were not designed to force out the entire Arab population; the areas where they took place were strategically vital and meant to prevent the threat of any rearguard action against the Israeli forces, and to insure clear lines of communication. Morris notes that “in general, Haganah and IDF commanders were not forced to confront the moral dilemma posed by expulsion; most Arabs fled before and during the battle, before the Israeli troops reached their homes and before the Israeli commanders were forced to confront the dilema” (The Birth of the Palestinian Refugee Problem Revisited, MA: Cambridge University Press, 2004, p. 592). Many Arabs claim that 800,000 to 1,000,000 Palestinians became refugees in 1947­49. The last census was taken in 1945. It found only 756,000 permanent Arab residents in Israel. On November 30, 1947, the date the UN voted for partition, the total was 809,100. 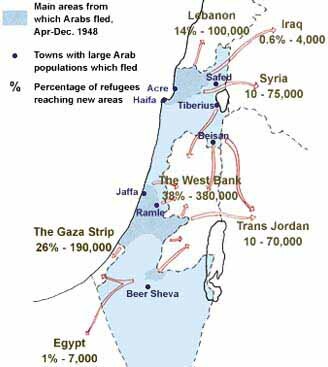 A 1949 Government of Israel census counted 160,000 Arabs living in the country after the war. This meant no more than 650,000 Palestinian Arabs could have become refugees. A report by the UN Mediator on Palestine (as of September 1948) arrived at an even lower figure — 360,000. The number of Jews fleeing Arab countries for Israel in the years following Israel's independence was roughly equal to the number of Arabs leaving Palestine. Many Jews were allowed to take little more than the shirts on their backs. These refugees had no desire to be repatriated. Little is heard about them because they did not remain refugees for long. Of the 820,000 Jewish refugees, 586,000 were resettled in Israel at great expense, and without any offer of compensation from the Arab governments who confiscated their possessions. Israel has consequently maintained that any agreement to compensate the Palestinian refugees must also include Arab compensation for Jewish refugees. To this day, the Arab states have refused to pay any compensation to the hundreds of thousands of Jews who were forced to abandon their property before fleeing those countries. The contrast between the reception of Jewish refugees in Israel with the reception of Palestinian refugees in Arab countries is even more stark when one considers the difference in cultural and geographic dislocation experienced by the two groups. Most Jewish refugees traveled hundreds — and some traveled thousands — of miles to a tiny country whose inhabitants spoke a different language. Most Arab refugees never left Palestine at all; they traveled a few miles to the other side of the truce line, remaining inside the vast Arab nation that they were part of linguistically, culturally and ethnically. A second refugee population was created in 1967. After ignoring warnings to stay out of the war, King Hussein launched an attack on Jerusalem, Israel's capital. The UN estimated that during the fighting 175,000 Palestinians had fled for a second time and approximately 350,000 left for the first time. About 200,000 moved to Jordan, 115,000 to Syria and approximately 35,000 left Sinai for Egypt. Most of the Arabs who left had come from the West Bank. When the Security Council empowered U Thant to send a representative to inquire into the welfare of civilians in the wake of the 1967 war, he instructed the mission to investigate the treatment of Jewish minorities in Arab countries, as well as Arabs in Israeli-occupied territory. Syria, Iraq and Egypt refused to permit the UN representative to carry out his investigation. Through November 2003, 101 of the 681 UN resolutions on the Middle East conflict referred directly to Palestinian refugees. Not one mentioned the Jewish refugees from Arab countries (Jerusalem Post, December 4, 2003). that refugees wishing to return to their homes and live at peace with their neighbors should be permitted to do so at the earliest practicable date, and that compensation should be paid for property of those choosing not to return and for loss of or damage to property which under principles of international law or in equity should be made good by Governments or authorities responsible. Instructs the Conciliation Commission to facilitate the repatriation, resettlement and economic and social rehabilitation of refugees and payment of compensation... (emphasis added). The emphasized words demonstrate that the UN recognized that Israel could not be expected to repatriate a hostile population that might endanger its security. The solution to the problem, like all previous refugee problems, would require at least some Palestinians to be resettled in Arab lands. At the time the Israelis did not expect the refugees to be a major issue; they thought the Arab states would resettle the majority and some compromise on the remainder could be worked out in the context of an overall settlement. The Arabs were no more willing to compromise in 1949, however, than they had been in 1947. In fact, they unanimously rejected the UN resolution. The General Assembly subsequently voted, on November 19, 1948, to establish the United Nations Relief For Palestinian Refugees (UNRPR) to dispense aid to the refugees. The UNRPR was replaced by the United Nations Relief and Works Agency (UNRWA) on December 8, 1949, and given a budget of $50 million. UNRWA was designed to continue the relief program initiated by the UNRPR, substitute public works for direct relief and promote economic development. The proponents of the plan envisioned that direct relief would be almost completely replaced by public works, with the remaining assistance provided by the Arab governments. UNRWA had little chance of success, however, because it sought to solve a political problem using an economic approach. By the mid­1950s, it was evident neither the refugees nor the Arab states were prepared to cooperate on the large-scale development projects originally foreseen by the Agency as a means of alleviating the Palestinians' situation. The Arab governments and the refugees themselves were unwilling to contribute to any plan that could be interpreted as fostering resettlement. They preferred to cling to their interpretation of Resolution 194, which they believed would eventually result in repatriation. While Jewish refugees from Arab countries received no international assistance, Palestinians received millions of dollars through UNRWA. Initially, the United States contributed $25 million and Israel nearly $3 million. The total Arab pledges amounted to approximately $600,000. For the first 20 years, the United States provided more than two-thirds of the funds, while the Arab states continued to contribute a tiny fraction. Israel donated more funds to UNRWA than most Arab states. The Saudis did not match Israel's contribution until 1973; Kuwait and Libya, not until 1980. As recently as 1994, Israel gave more to UNRWA than all Arab countries except Saudi Arabia, Kuwait and Morocco. In 2003, the United States contributed more than $134 million of UNRWA's $326 million budget (41%). All of the Arab countries combined contributed less than $11 million (3%) and $7.8 million of that was from Saudi Arabia, meaning the rest of the Arab world contributed less than $3 million (1%). When the Arab states are ready to conclude a peace treaty with Israel this question will come up for constructive solution as part of the general settlement, and with due regard to our counter­claims in respect of the destruction of Jewish life and property, the long-term interest of the Jewish and Arab populations, the stability of the State of Israel and the durability of the basis of peace between it and its neighbors, the actual position and fate of the Jewish communities in the Arab countries, the responsibilities of the Arab governments for their war of aggression and their liability for reparation, will all be relevant in the question whether, to what extent, and under what conditions, the former Arab residents of the territory of Israel should be allowed to return. The implied danger of repatriation did not prevent Israel from allowing some refugees to return and offering to take back a substantial number as a condition for signing a peace treaty. In 1949, Israel offered to allow families that had been separated during the war to return; agreed to release refugee accounts frozen in Israeli banks (eventually released in 1953); offered to pay compensation for abandoned lands and, finally, agreed to repatriate 100,000 refugees. The Arabs rejected all the Israeli compromises. They were unwilling to take any action that might be construed as recognition of Israel. They made repatriation a precondition for negotiations, something Israel rejected. The result was the confinement of the refugees in camps. Despite the position taken by the Arab states, Israel did release the Arab refugees' blocked bank accounts, which totaled more than $10 million. In addition, through 1975, the Israeli government paid to more than 11,000 claimants more than 23 million Israeli pounds in cash and granted more than 20,000 acres as alternative holdings. Payments were made by land value between 1948 and 1953, plus 6 percent for every year following the claim submission. After the Six-Day War, Israel allowed some West Bank Arabs to return. In 1967, more than 9,000 families were reunited and, by 1971, Israel had readmitted 40,000 refugees. By contrast, in July 1968, Jordan prohibited persons intending to remain in the East Bank from emigrating from the West Bank and Gaza. It is inconceivable that the refugees should be sent back to their homes while they are occupied by the Jews, as the latter would hold them as hostages and maltreat them. The very proposal is an evasion of responsibility by those responsible. It will serve as a first step towards Arab recognition of the State of Israel and partition. The Arabs demanded that the United Nations assert the “right” of the Palestinians to return to their homes, and were unwilling to accept anything less until after their defeat had become obvious. The Arabs then reinterpreted Resolution 194 as granting the refugees the absolute right of repatriation and have demanded that Israel accept this interpretation ever since. It is well-known and understood that the Arabs, in demanding the return of the refugees to Palestine, mean their return as masters of the Homeland and not as slaves. With a greater clarity, they mean the liquidation of the State of Israel (Al-Misri, October 11, 1949). After the 1948 war, Egypt controlled the Gaza Strip and its more than 200,000 inhabitants, but refused to allow the Palestinians into Egypt or permit them to move elsewhere. Although demographic figures indicated ample room for settlement existed in Syria, Damascus refused to consider accepting any refugees, except those who might refuse repatriation. Syria also declined to resettle 85,000 refugees in 1952-54, though it had been offered international funds to pay for the project. Iraq was also expected to accept a large number of refugees, but proved unwilling. Lebanon insisted it had no room for the Palestinians. In 1950, the UN tried to resettle 150,000 refugees from Gaza in Libya, but was rebuffed by Egypt. Jordan was the only Arab country to welcome the Palestinians and grant them citizenship (to this day Jordan is the only Arab country where Palestinians as a group can become citizens). King Abdullah considered the Palestinian Arabs and Jordanians one people. By 1950, he annexed the West Bank and forbade the use of the term Palestine in official documents. In 1952, the UNRWA set up a fund of $200 million to provide homes and jobs for the refugees, but it went untouched. Any discussion aimed at a solution of the Palestine problem which will not be based on ensuring the refugees' right to annihilate Israel will be regarded as a desecration of the Arab people and an act of treason (Beirut al Massa, July 15, 1957). Little has changed in succeeding years. Arab governments have frequently offered jobs, housing, land and other benefits to Arabs and non-Arabs, excluding Palestinians. For example, Saudi Arabia chose not to use unemployed Palestinian refugees to alleviate its labor shortage in the late 1970's and early 1980's. Instead, thousands of South Koreans and other Asians were recruited to fill jobs. The situation grew even worse in the wake of the Gulf War. Kuwait, which employed large numbers of Palestinians but denied them citizenship, expelled more than 300,000 of them. “If people pose a security threat, as a sovereign country we have the right to exclude anyone we don't want,” said Kuwaiti Ambassador to the United States, Saud Nasir Al-Sabah (Jerusalem Report, June 27, 1991). Most of whom were expelled settled in Jordan. By the end of 2010, the number of Palestinian refugees on UNRWA rolls had risen to nearly 5 million, several times the number that left Palestine in 1948. In just the past three years, the number grew by 8 percent. Today, 42 percent of the refugees live in the territories; if you add those living in Jordan, 80 percent of the Palestinians currently live in “Palestine.” Though the popular image is of refugees in squalid camps, less than one-third of the Palestinians are in the 59 UNRWA-run camps. Now the camps are in the hands of the Palestinian Authority (PA), but little is being done to improve the lot of the Palestinians living in them. Netty Gross of the Jerusalem Report (July 6, 1998) visited Gaza and asked an official why the camps there hadn't been dismantled. She was told the Palestinian Authority had made a “political decision” not to do anything for the nearly half a million Palestinians living in the camps until the final-status talks with Israel took place. In fact, between June 2000 and June 2003, the number of Palestinians living in camps in the PA has increased by nearly 50,000 (8 percent) and the overall number of refugees has grown by 11 percent. Since 2003 an estimated 19,000 Palestinian refugees have fled Iraq due to harsh, unwelcoming social conditions. Activists in Iraq have reported harassment, attacks, and intimidation from Shiite militias and police forces directed against the Palestinian refugee population. Syria was home to a large community of Palestinian refugees, who have attempted to flee since the breakout of Syria's civil war. Since the begining of the conflict, an estimated 70,000 Palestinian refugees have fled Syria and have been living undercover in neighboring countries, using fake names and constantly moving. The only country that accepts Palestinian refugees from Syria is Turkey, and if they are caught in Jordan, Lebanon, or Egypt, they face deportation back to Syria. For decades the refugees have held the UN responsible for ameliorating their condition. Though many Palestinians are unhappy with the treatment they have received from their Arab brothers, most refugees focus their discontentment on “the Zionists,“ whom they blame for their predicament rather than the vanquished Arab armies.